You’ve been diagnosed with lung cancer. What now? If you’ve been diagnosed with lung cancer there are probably a few questions popping up in your head. We want to help answer some of those questions and guide you to helpful information about lung cancer. First, there are a couple types of lung cancer. The type you have will determine the lung cancer treatment you’ll need. The two most common forms of lung cancer are small cell and non-small cell lung cancer. You can read more about the diagnosis process, staging, and treatment options for each type by visiting our Lung Cancer page. What Kind of Doctor Should You See? Your lung cancer diagnosis may have come from your primary care physician, a pulmonologist (lung specialist), or another doctor who cared for you when you first noticed symptoms. However, you’ll need to be referred to an oncologist for cancer treatment. Oncology is the study of cancer, and a medical oncologist is someone who is an expert in medicines such as chemotherapy or immunotherapy as a primary cancer treatment method. The medical oncologist also typically leads the care for lung cancer patients after diagnosis, bringing in other types of doctors as needed for your individualized treatment plan. Your medical oncologist will spend time with you and help you understand your specific situation and will consult with a multidisciplinary team of lung cancer experts to develop a specific treatment plan for you, based on the type of lung cancer you have. Radiation oncologist, who uses radiation therapy to target the cancer cells and kill them. Oncology nurses who will administer chemotherapy and other lung cancer-fighting medicines in our offices and help answer the questions that often come up. Other cancer care specialists who can assist with nutrition, supportive care, etc. We highly recommend you bring a support partner with you to your appointments. This person should be able to help you with taking notes and listening since there will be a lot of information reviewed and it can be hard to process everything if you’re alone. 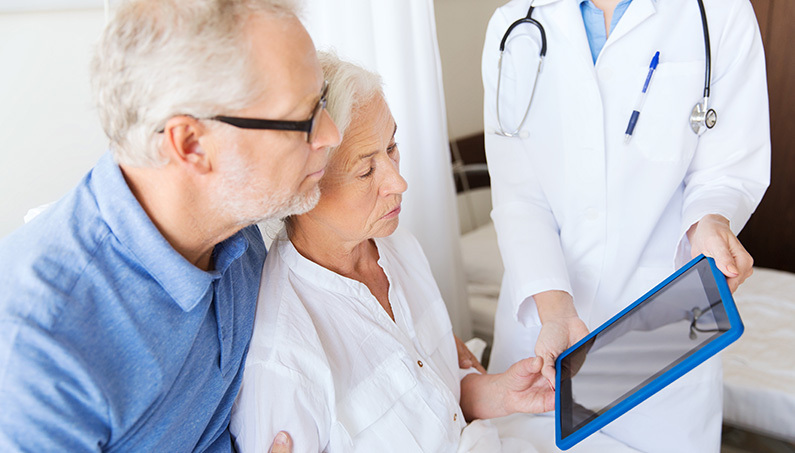 Read our Your First Visit section before your initial visit to Arizona Oncology. Before you see an oncologist, we recommend getting a notebook and folder to take notes and keep paperwork together during your lung cancer treatment journey. Start notetaking as soon as you’re diagnosed, even if you’re seeing your PCP or a pulmonologist before you consult with an oncologist. Keep track of any questions that you or your family member have, important dates, medicine and supplement schedules, and how you are feeling. This is all important information to share with your lung cancer care team. If you smoke, what programs are available to help you stop as quickly as possible? If you smoke, are there medications that are available to stop the craving for nicotine? What type of lung cancer do you have and what is the recommended treatment process for it? What are the side effects you might have? Should you need to continue going to your primary care doctor for things that may not seem like they’re a cancer symptom or side effect of treatment? Should you call your primary care doctor or the oncology office if you have questions about things that may not seem related to the cancer treatment? Will you need surgery? At what point in the treatment process would that occur? Are there any activities to avoid? Any activities that you should add to your routine? What is best to eat and drink while going through lung cancer treatment? Are there any lung cancer research trials that might be an option for me? Is there access to supportive care such as support groups or counseling? Are there any patient resources specific to Northern Arizona, Phoenix or Southern Arizona that I can take advantage of? What is the Extent of My Lung Cancer? Once you’ve chosen an oncologist to treat your lung cancer, they will determine the stage of your lung cancer based on the results of any biopsy and/or images taken. The stage of your lung cancer will be a determining factor in the treatment that is recommended. At Arizona Oncology, the lung cancer oncologist will recommend treatment for your individual situation and specific type of lung cancer. Because Arizona Oncology has locations throughout Arizona, your lung cancer treatment can be provided at a clinic that is most convenient to your home or work. To learn more about the various types of treatment for lung cancer, visit our Lung Cancer Treatment Options section. Through our participation in US Oncology Research, we can provide our patients access to cutting-edge and innovative clinical trials in a comfortable and convenient setting in many regions of Arizona. We offer clinical trials that are not available anywhere else in our area and are currently offering multiple trials for eligible lung cancer patients. Learn more and view open lung cancer clinical trials by visiting our Clinical Trials & Research page. Be sure to ask your physician if any of our current clinical trials are a good fit for you. The financial aspect of cancer treatment is one of biggest concerns for most patients. You’re probably wondering what your insurance will cover for cancer treatment. We participate with most insurance carriers, and if you obtain a description of your medical insurance benefits, our staff can answer questions and guide you through the details based on the specific lung cancer treatment the oncologist has planned for you. View our accepted insurance plans on our Insurance page, or call us at 1-800-331-1612 for help determining if our cancer specialists participate with your insurance plan. It’s really important that you feel confident in the cancer diagnosis that you’ve been given and the oncologist who will be leading your lung cancer treatment. Many patients choose to get a second opinion before beginning any lung cancer treatment plan, and that is perfectly normal. At Arizona Oncology, our physicians provide many second opinions – for all types of cancer diagnoses and treatment plans. Most insurance companies will cover a second opinion assessment, but you should always check with your insurance provider to check your coverage before requesting a referral. If you’re considering a second opinion with a physician at Arizona Oncology, please contact one of our locations nearest to you throughout Northern Arizona, Southern Arizona or Phoenix. We know this is a difficult time, but you can do this. The Arizona Oncology team of physicians and cancer care specialists are ready to help you every step of the way. Visit our Helpful Resources page for more information.